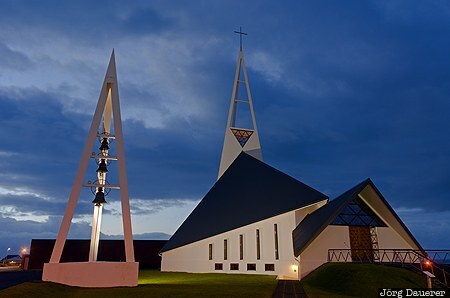 The flood-lit modern church of Ólafsvík at the Snæfellsnes Peninsula with its separate bell tower at the blue hour. Ólafsvík is in Vesturland in the west of Iceland. This photo was taken in the evening of a cloudy day in September of 2013. This photo was taken with a digital camera.